*1979 in Singkawang, West-Kalimantan, Borneo. Sie brachte sich das literarische Schreiben autodidaktisch selbst bei mit Hilfe von Büchern und dem Internet. Ihre Gedichte, Essays und Artikel wurden in verschiedenen Medien und Literaturmagazinen veröffentlicht. Der Gedichtband A Man Bathing and Other Poems, wurde 2015 dreisprachig in Englisch, Deutsch und Indonesisch herausgegeben (Lontar Foundation). Ihre erste Gedichtauswahl wurde vom Magazin Tempo zum besten Poetry Book 2011 gewählt. *1979 in Singkawang, Western Kalimantan. She learned to write as an autodidact through the web and readings. Her poems, essays and articles were published in many mass media, literary magazines and journals. A Man Bathing and Other Poems, a trilingual work in English, German, and Indonesian, was published by Lontar Foundation in 2015. 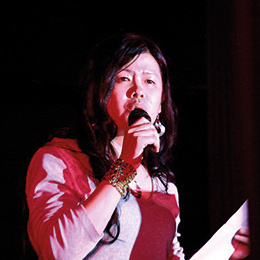 Her first collection of poems has been selected as "2011 Best Poetry Book" by Tempo magazine. tumbuh, tempat angin berlabuh. Datanglah ke mari. Ada perempuan yang rindu rumah. bisa dibeli demi harga diri. berbuah ranum kuning terang kehijauan--seperti pipi. yang mengusir pergi gadis sipit kuning di pipi. mencipta gembur. Tumbuhlah pohon! Tinggilah batang! Suburlah daun! kita buka jendela: melihat langit masih terbentang. memandang pipi pada kulit matangnya yang ranum. Ia mengelus batang, memanjat pohon sambil bernyanyi. Dari jendela daun, cakrawala tetap terbuka. Langit begitu luas. the fruit skin is greenish yellow – like a dream. The graveyard’s walls are refined. They are strong, shining under the full moon. grows and the wind freely rests there. Please come over. There is a woman who needs a home. can be acquired for the sake of self respect. where we can share without loosing anything. A papaya tree grows, its fruits are bright, yellowish green – like cheeks. that expelled slanting-eyed girls with yellow cheek. even more than that, lust was free. I found a lonely girl cried. Just imagine her, before she died. and luxuriance. And the trees grow! Grow taller! The leaves are green! the leaves: the sky still spreads out. that comes by to take a rest. Henceforth, no sadness is allowed. Henceforth, no memory is allowed. stares at the ripeness of the papaya fruit skin. He caresses the tree, climbs it and sings. with the taste of the happy dead body. The women praise. Through the leaves we see the horizon, it’s still there. The sky is vast.